"Miss Solitaire used to know all about the future. She was especially good at predicting death." Having been outed as the two faced Harlem gangster, Mr. Big, Dr. Kananga flees to his island hideaway of San Monique, in the Caribbean. Here he has been stockpiling poppies in order to flood the US drug market and hook a whole generation of customers on his addictive substances. He has a bargaining chip, the beautiful and innocent Solitaire. Bond: "An underground monorail. Connected to the last refuge of a scoundrel, no doubt." 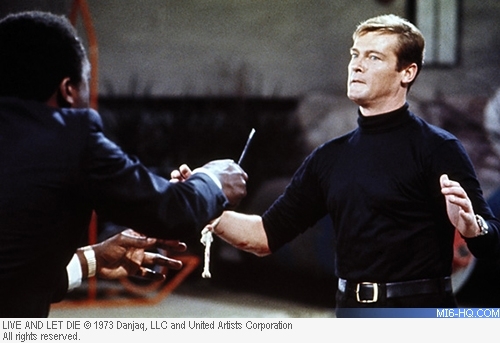 Bond arrives at Kananga's stronghold in time to do battle with his mystical goon, Baron Samedi, shooting the decoy Baron through the forehead and sword fighting the "real" Loa. Like everything in voodoo-land, Bond discovers the ritual is a front for Kananga's escape - with as much of the opium as he can - via underground rail. It's only momentarily that Bond can evade the guards and he soon comes face to face with the villain. 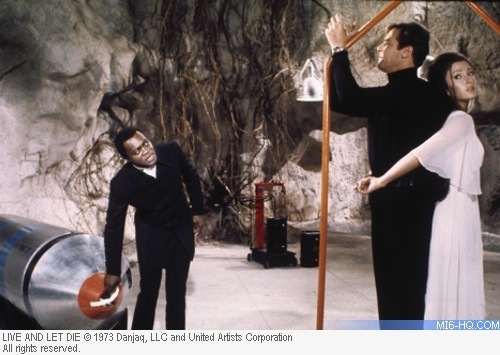 Kananga pompously tells 007 he's a step ahead, having found his escape plan, including shark gun, and is intrigued by the Q-Branch gadget. 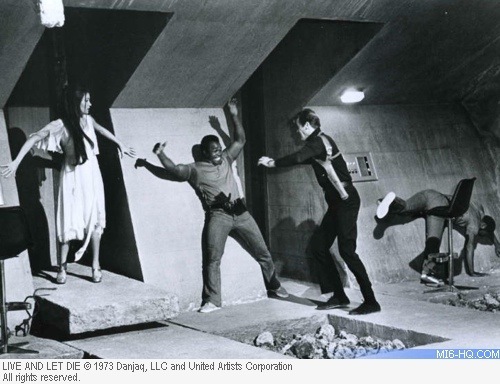 Having trialled it on Wisper's couch, Kananga proceeds to espouse his master plan.With little left to reveal, Bond and Solitaire are trussed to a moving platform and 007's arms cut to draw blood. With Kananga intending for 007 to be left to the sharks in his villainous shark-pool. Bond has one last trick up his sleeve: the Rolex buzz-saw and electro magnet. Deploying the magnet to flick a shark gun pellet to his wrist and the buzz-saw to cut through his bindings, Bond then faces off against the villain, at first unarmed. The struggle plays out in the shark pool, with both villain and secret agent toppling into the blue. Bond gets the upper hand and forces Kananga to swallow the live shark pellet. The inflating pellet works its magic on Kananga, in a grotesquely comical fashion.